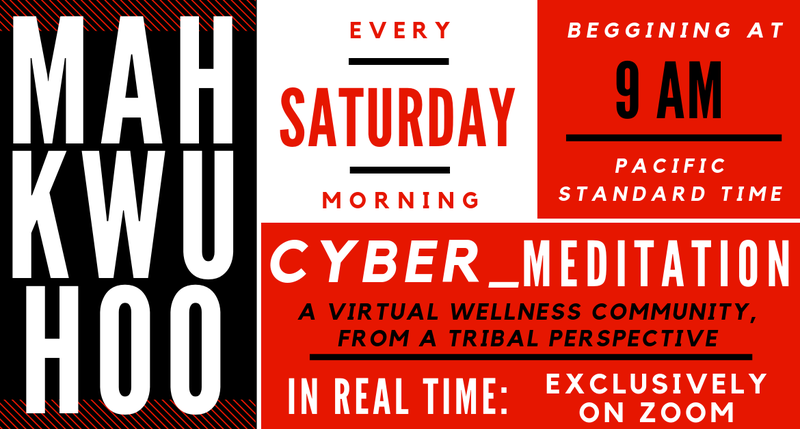 Mahkwuhoo: Cyber_Mediation is a virtual-wellness community (from a tribal perspective), designed to help you connect with people from all over the world! Utilizing the power of Zoom (a webinar platform), it is now possible to strengthen your individual (or group) meditation (and breathing) practice, without ever leaving the house. I’ll be conducting weekly Mahkwuhoo (Guided Meditation) sessions, on Saturday Morning’s at 9 am (Pacific Standard Time). As long as you have an internet connection, or a telephone to dial in, you can plan on spending 1.5 hours, with your relatives from all around the world! Each session is $12 (plus applicable tax). You will receive an email registration confirmation, at the email address you registered with. Within that email, you will be provided a link with a private URL (unique to only you, and valid for each individual session). Click on the URL link (in your confirmation email) to join the webinar, to gain direct access. If you are going to join in over the telephone (to listen only), you can dial in on one of the phone lines provided at the bottom of your registration confirmation email, and include the webinar ID (also, included in your registration email confirmation) to join in! Simply, send me an email (attached to your registration confirmation), No Excuses or Reasons Necessary, and I will send you the recorded version of what you missed, absolutely free! Virtual Seating is Limited. Register Today!